For many seniors, finding reliable, affordable car insurance in Texas can be challenging. Whether you’re on a fixed income or you’ve been insured for several decades with the same company, making changes can be a bit daunting. But with the competitive nature of the automobile insurance industry, the more informed you are, the more likely it is you will find quality coverage at a price you can afford. If you’re a Texas senior who may be considering making changes to an automobile insurance policy, here are a few tips for finding a quality provider and keeping your rates low. Finding insurance quotes is easy. In fact, a quick search online reveals literally hundreds of companies- all vying for your business. While this can seem overwhelming, it’s actually an advantage and benefits you by making it easier to compare rates between companies. Keep in mind, while most of the major carriers are competitive, they are not required to provide the same benefits for the same price- and they seldom do. Stay with names you know and trust for ensuring you get only quality coverage that will be there for you when you need it. Using an independent agent who has access to the right information can save you time and money. Local, independent agents have up to date and accurate information on relevant deals and discounts that you may not be able to secure on your own. 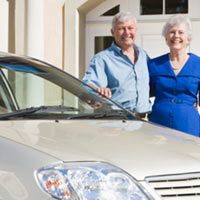 Most of the major carriers offer discounts for senior car insurance in Texas. And it’s worth the time and effort to see what’s available. Generally, for mature drivers over the age of 50, if you are changing providers, the reduced rate should be automatically reflected in the quote. Discounts range anywhere from 5-10 percent. But be cautious and review your current policy if you’ve recently turned 50 to ensure the new rate has been applied. You may have to actually ask to receive the discount. In addition to a discount for age, be prepared to take a defensive driver exam, offered to many seniors to secure lower rates on car insurance. You may also be eligible to receive a discounted rate if you are retired or not working full time. Statistically, seniors are more likely to be involved in an accident than younger drivers. Decrease your odds and keep your Texas car insurance rate low by staying vigilant while on the road. Remember, it may not be you that causes an accident, but it is your monthly premium that will increase if you are involved. Driving defensively, obeying traffic laws and not speeding all help to keep your monthly premium low. As a senior in Texas, you deserve to have access to the same reliable car insurance as other drivers, and at a price you can afford. If you are considering changing providers or simply looking to see what’s available, make certain to take advantage of the opportunities afforded you. Use a local independent agent to help you compare rates between providers and always inquire about relevant discounts. Finally, stay safe on the roads and drive defensively to maintain a clean driving record and the lowest rates possible.